The --list (or -L) allows to make 1D-scans that are not equidistant or even filename strings etc. A new set of components referred to as "Union" components, contribution by Mads Bertelsen Uni Copenhagen. PowderN can "flip" the d_phi focusing to "zoom" on a range of angles. October 6th, 2016: Use Microsofts "Windows subsystem for Linux" for running McStas under Windows 10! Partnering with Ubuntu Linux, Microsoft has released the (experimental) feature "Windows subsystem for Linux" (WSL), also known as "Bash on Ubuntu on Windows". Read more here and here. It turns out that it is relatively straightforward to get McStas running under this new feature - thereby overcoming some of the annoyances of McStas on the Windows platform. Update it beyond "Windows 10 Version 1607" - aka the "anniversary build"
Use "turn features on or off" to enable "Bash in windows"
Install McStas as usual on a Debian systems. Also remember that you can easily install openmpi etc. As the feature is considered experimental, you might still find some rough edges, but so far it seems functional and looks very promising! An easy way to access your data simulated under Linux is to run from within your Windows home folder, accessible under Linux at /mnt/c/Users/<your_username>. Download McStas 2.3 labled for use on El Capitan from http://downloads.mcstas.org/mcstas-2.3/mac/ and unpack. Open the resulting McStas-2.3-10.11_El_Capitan folder. Follow instructions in the terminal that opens. If you upgraded from an earlier Mac OS X release, your installed McStas 2.3 is expected to "survive" that upgrade. folder in the download site, find the relevant mcstas-comps-2.3 package and install it on top of your existing McStas 2.3. The moderator is of course also available as a "DIY update archive" for people running older versions of McStas, and can be downloaded from a new update folder at the download site or from the share. For more information on the updated ESS moderator, its use and benchmark data, please consult http://ess_butterfly.mcstas.org. The website also contain (currently draft) documents written with Ken Andersen and Luca Zanini, explaining the reasoning behind changing from the BF2 design to the BF1 design, neutronical calculations and benchmarks. Please note that these are still in DRAFT status, are expected to be in their final shape around 2016-09-22. Bug-fixed MCPL i/o components and library - see https://mctools.github.io/mcpl/ for more details. ... plus other minor things, see the GitHub log for mcstas-comps for more information. Development is also moving fast on our tools, so we are further planning to release a McStas 2.4 within forseeable future. April 6th, 2016: McStas 2.3 released! Selected, important highligts from the release are listed below. The full list of changes is also available HERE. As of McStas 2.3, we support a new binary event file format: "MCPL" (Monte Carlo Particle List), developed by Thomas Kittelmann, ESS. The format aims to allow easier interchange of particle event data between monte carlo codes, and read/write functionality has been implemented for MCNP, Geant4 and McStas. Interoperability with Mantid has been improved, as OFF-based detectors can be used to define detector geometries in Mantid-oriented simulation runs. See https://github.com/McStasMcXtrace/McCode/wiki/McStas-and-Mantid for more documentation on the use. New components MCPL_input and MCPL_output by Erik Knudsen. Used to read and write MCPL binary event files. See corresponding test instruments below. New component Refractor.comp by Emmanuel Farhi and Bob Cubitt, ILL. Implements a single bulk material shape that can be used as a prism or lens. PerfectCrystal.comp by Markus Appel, ILL / FAU Erlangen-Nuernberg. Perfect crystal component, primarily for use as monochromator and analyzer in backscattering spectrometers. Reflections are simulated using a Darwin, Ewald or Gaussian profile. Doppler movement of the monochromator is supported. MultiDiskChopper.comp by Markus Appel, ILL / FAU Erlangen-Nuernberg. Models a disk chopper with a freely configurable slit pattern. For simple applications, use the DiskChopper component instead. Updated version of Sample_nxs from Mirko Boin (HZB), including more nxs material definitions. Bugfix to ESS_moderator from Jan Saroun (RESTRAX/Simres): missing focusing/direction cosine inserted. Please note that this component does not implement "engineering reality" and currently uses a coordinate system centered on the moderator assembly. An updated moderator component which references the "Moderator focus coordinate system" will be released later during the spring of 2016. New test instrument Test_PowderN_Res.instr, demonstrates difference of using 'banana, theta' and 'banana, divergence' in Monitor_nD - and can be used to show influence of sample size on detected line with in diffractometers. New test instrument LLB_6T2.instr by Xavier Fabreges, LLB. Model of the LLB 6T2 thermal single crystal diffractometer. New ILL_IN13.instr by E. Farhi and A. Dennison, ILL. Models the IN13 Thermal neutron backscattering spectrometer. If you take a look at this e-neutrons.org page, you will see that it resembles the examples part of a McDoc documentation page - with one exception: The Run simulation links on the right side of the table points to virtual instruments that may be run through the new McStas web frontend. As usual, you must have an account at e-neutrons.org to execute these simulations. 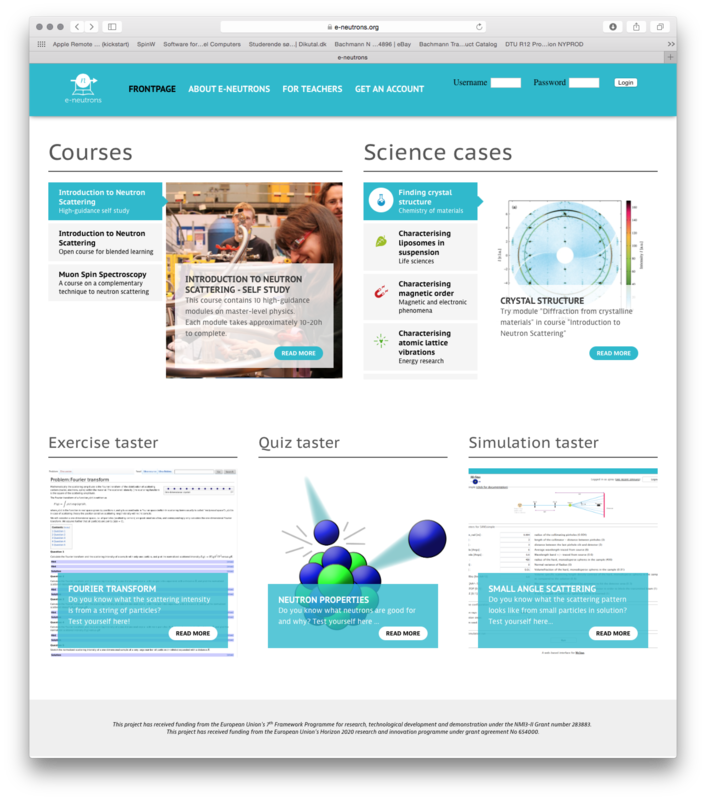 We are happy to officially announce the availability of e-neutrons.org: An e-learning platform for neutron scattering. The platform will be further developed and the learning material expanded in connection with SINE2020 (EU-H2020). To access the e-learning portal, go to https://www.e-neutrons.org, choose "Get an account" and fill in your personal information. We hope that you will enjoy this new resource and encourage you to try it out! 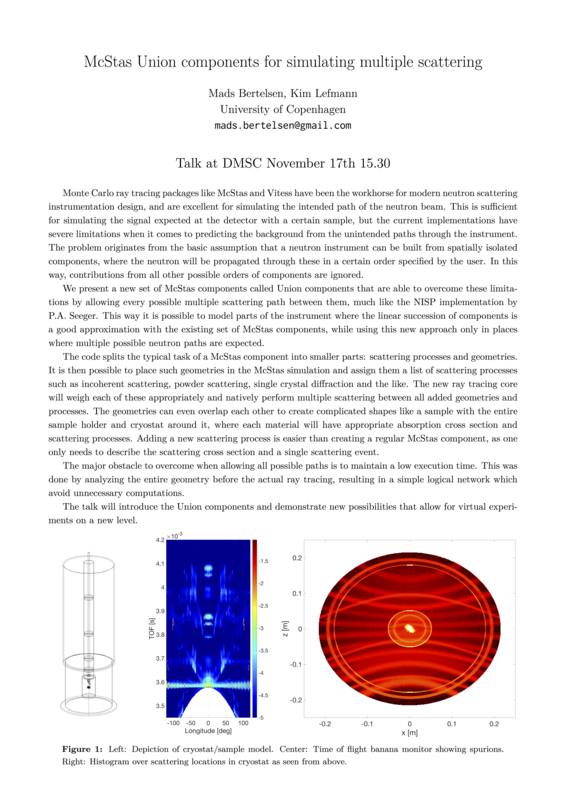 For background information on the platform, the teaching material and didactical considerations, please read the related article from Neutron News Volume 24, Issue 1, 2013 - DOI:10.1080/10448632.2013.751795. The main funding for the project is provided by the European Union's 7th Framework Programme for research, technological development and demonstration under the NMI3-II Grant number 283883 and from the European Union's Horizon 2020 research and innovation programme under grant agreement No 654000. We are also grateful for the financial support recieved from the University of Copenhagen via the "Good Education" and "Education 2016" programmes and from Interreg IV via the OMIC programme. Tk::Error###: This shouldn't happen at /usr/share/perl/5.18/Text/Wrap.pm line 84. - then the fix is to replace run_dialog_create in your local mcgui by follwing the instructions described here. Previous news items: 2015, 2014, 2013, 2012, 2011, 2010, 2009, 2008, 2007, 2006, 2005, 2004, 2003,2002, 2001, 2000, 1999, 1998.